Our purpose is to glorify God. We seek to fulfill the great commission by establishing biblical churches in Ukraine and other former Soviet bloc nations. 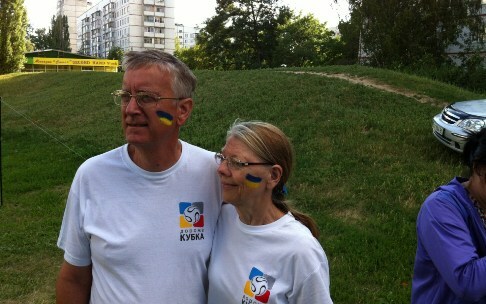 We are church planting missionaries to Ukraine. Freedom - Ukraine now has religious freedom. We have already helped start churches here. Travel - Ukrainians can easily move between former Soviet bloc nations to plant and build churches. Urgency - Many from the former Soviet Union are being saved and some are being called to pastor new churches. We need to build International Baptist Bible College and prepare them now. Size - Ukraine is the second largest European country. Sending Nation - Ukraine has the ecomonic and spiritual potential to become a major missions sending nation. God has called us to Ukraine. Where should support funds be sent? Please indicate it is for "Mintons - Ukraine." All support goes into our account and will be used for our Ukraine ministry.